I've never done this before, but since all the cool kids have drawings on their blogs, I figured I should give it a try! 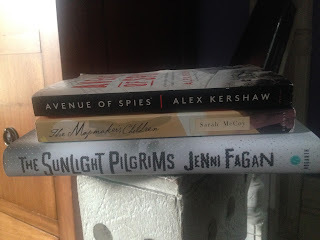 These are three books I have reviewed through Blogging for Books, that I enjoyed well enough (solid 3 stars) but feel no need to keep in my collection. (The Sunlight Pilgrims, The Mapmaker's Children, Avenue of Spies). 2) Which of these three books you would like (check out previous blog entries or my Goodreads page for reviews). I'll draw the winners on Thursday night, and you can pick up if you come to the pool party! I'm a sucker for apocalyptic novels. Can't get enough of them. 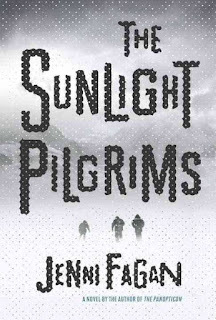 And living on Minnesota, winter is always heavy on my mind, so The Sunlight Pilgrims seemed right up my alley. Enough so that I did not honestly pay a lot of attention to the details before I picked it up. First of all, this is not set in the far-future. It's set in the winter of 2020 — which is, for all intents and purposes, is right around the corner. To be honest, I'm not sure that I want to contemplate an apocalypse that is quite that close. Especially a wintry one. I also missed that it was a YA novel — though truth be told, the jury is out as to whether is actually a YA novel, or just written by a young author. That was actually a nice surprise, since the coming-of-age story of Stella (formerly Cael) was the strongest part of the book to me. My fascination with WWII history began at an early age. My mother was very interested in it, and I remember reading (and watching) The Holocaust in fourth grade and being told by a teacher's aide to put it aside for later. Since then, I've devoured as much about it as I could. 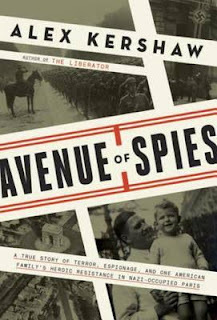 I was initially disappointed in Avenue of Spies. A quick skim through the book showed a rather dry past tense writing that is just not my preferred style. I came close to just putting it aside. It clearly had a lot of research and information in it, but I was just not sure it would captivate me. But I had it with me for a weekend away, so I sat down by the lake to read it and was soon taken in. The true story, of an American doctor married to a French woman and practicing in Occupied Paris, was really captivating, as was their involvement in the Resistance. The French WWII story is so often overlooked, and is extremely complex. I thought this would be a sophisticated summer. After all, we started with a week in Paris. I thought it would be The Summer of Fizz, with gin fizz drinks a-plenty. Some theatre, concerts, maybe jazz. Music in the park. Classic films. Champagne brunches. Long novels. Croquet. Instead, it's kind of been the opposite of that. We've gone up to the cabin twice, gone to girl scout horse camp, gone camping with Beatrix's troop. We've canoed, and gone on picnics. We've gone to farms, fed the animals, cuddled kittens, collected eggs. Instead of gin drinks, we have had A LOT of s'mores. It's been more about DQ than gourmet ice cream. We've adopted a scruffy new dog and taken him on walks. Beatrix's favorite two camps have been the Warner Nature Center and DayCroix. She is tan, and a little scabby and bug-bitten. And that's exactly how summer should be.